Do you want to track your time together? 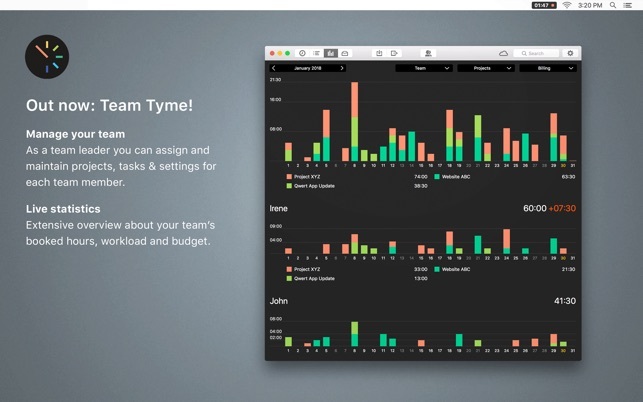 Tyme offers time tracking for teams. Tyme fully adopts the new macOS dark mode and has an optional light mode, if you prefer brighter colors. 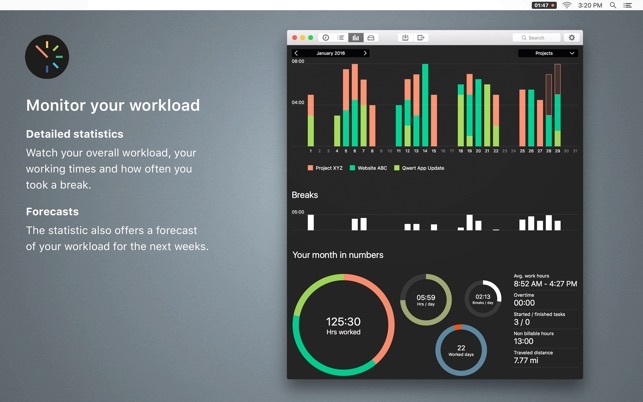 Use the statistics to monitor your workload, your working times, how often you took a break and what your average day looks like. The statistics also offer a forecast of your workload for the next weeks. Besides daily, weekly, monthly, annual time frames, you can also choose custom ranges. 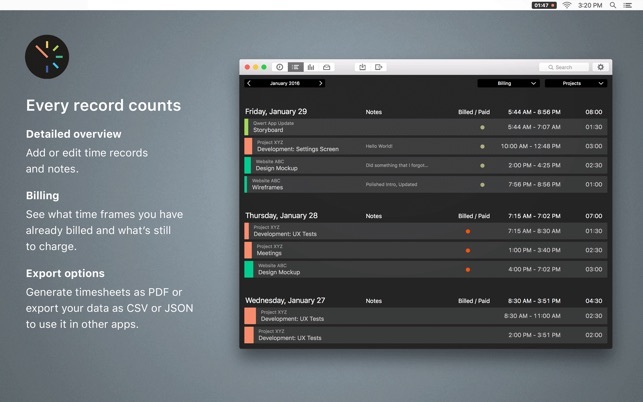 Generate time sheets as PDF, export your data as CSV or JSON to use it in other applications or use AppleScript to connect to the workflows of other apps. You can also export the whole database as a backup file. Your time entries can be exported to GrandTotal. Import your data from Tyme backups, CSV files, mite or via AppleScript. 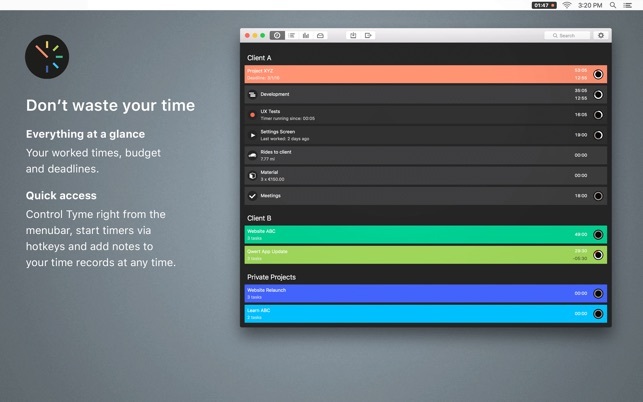 Tyme can be used without a mouse and has keyboard shortcuts for almost all actions. With the Tyme iOS app, you can track your time, mileage and fixed costs on the go. It also offers geofencing - No need to manually start or stop a timer; it can be done automatically based on your location. Tyme for iOS is available as a separate purchase. Team Tyme: The subscription is charged monthly. The price is based on the number of users in the team and displayed in Tyme at the time of purchase. Each subscription can be terminated at any time. Subscriptions are debited from your iTunes account. Subscriptions renew automatically if automatic renewal is not disabled at least 24 hours before the end of the current subscription period. Your iTunes account will be charged for renewing your subscription 24 hours before the current subscription period expires. Subscriptions can be managed and cancelled in your account settings. As soon as you subscribe, the free trial version expires. If you’re looking for a versital tool to track your time, this is a great app. I had been using the cloud-based “MyHours” website, which was free. When that site started being offline when I needed to log time, I looked for a replacement. The impotrant thing for me was portability, allowing me to work on multiple machines or my phone. 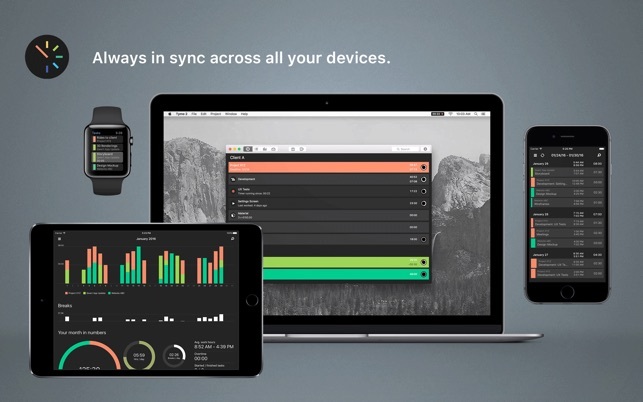 This app does all: Through the syncing function, I’m able to sync time logged between my desktop, laptop, iPhone and iPads. I can start time from one system, and end it on another; I can create a client, job and task on one device, and it updates everywhere else. The menu tool icon is helpful, and once you have your jobs listed you can easily switch between them just by going to the menu bar, or by using pre-assigned hot keys. The reporting feature is great too, allowing you to easily see time worked as a whole or with individual projects. I can’t recommend it enough - it’s great. This product is just great. Does exactly what it should, with little to no hiccups ever as updates keep shipping. Color theme, UI, all of it makes me WANT to use it. Savable export setups. I would love to be able to save an often-exported set of information such as a bi-weekly mileage report or weekly project report. So atop the “Start Date” input box, could just be a dropdown for “Presets.” It would be cool, too, if I could even specify the relative date range like “Last 14 Days of… (selected items)” and save that as “Bi-weekly Mileage and Time” Preset. Basically having the ability to always call up a timeframe of data from when I need it would just minimize the tedious clicking through the calendar and checkboxes. May be a bit over the top for a something that’s already very easy to use, but the workflow nerd in me would love a feature like this. Either way - still a great app, keep it up!! This app was great for a while — until it started getting very buggy and stopped working. It has erased my tracked times, refused to create new tasks, and generally stopped being usable. I have tried downloading it and re-installing it several times. I have tried contacting the developers several times — never a single message back to even acknowledge that they’ve received my email. It is as if they’ve disappeared off the face of the earth, and I feel like I’ve wasted my money. Such a shame, because this app has a nice design and everything I need — if only it worked! Don’t waste your time or energy on this one. We didn't disappear and try to respond to each support mail. Maybe it went into your spam folder? Please drop us a mail: https://www.tyme-app.com/support/ and tell us the issues you're having.